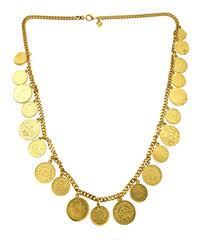 The moment you think of Traditional South Indian Jewellery, heavy ornaments come to our mind. But rich beauty also comes to our sight. A bride wearing traditional South Indian Jewellery in combination of a Kanjeevaram saree is a visual bliss. No one can take off their eyes from the bride, especially the groom. South Indian Tradional Jewellery, is a must in every woman’s Jewellery box. What is South India? Andhra , Karnataka, Tamilnadu and Kerala. Each state has their unique style of jewellery designs. Rich, beautiful and heavy. No doubt South Indian Women are very beautiful, traditional , look ethnic and very rich. The moment you think of Andhra Kaasulaperu comes to mind. A rich traditional Ornament, even though not bought by today’s andhra women, passed on to them by their mom’s. One more is jada kuppelu, tied to your plait. Karnataka Tradition is also very different, unique , rich and stunning. Kada is Karnataka’s Pride, worn passionately by all jewellery lovers. It’s intricate design gives an unique feel of touch and view too. Check it’s beauty. A must in your collection. Isn’t it? crafted droplets in between multi chains giving a completely stunning appearance. Tradition of Tamil Nadu ! The moment you think of Tamil Nadu Tradition can kanjeevaram’s, temples and jewellery be far behind? The State also offers us Temple Jewellery, Rich Jewellery and Stunning Jewellery. I’m personally big fan of Tamilnadu Jewellery. 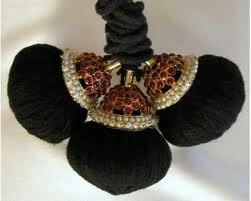 These are called Surya and Chandra which are hair accessories and when you wear them you look very traditional. It gives you that ethnic look. Today the jewellery of Kerala is so special and unique , the shops are existent in every city. Enter the shop and you shall find some unique and stunning collections. Especially Kerala Style Jhumkas are so rare and special. For weddings this is the stunning set. Visit http://www.bharatjwellery.com for buying branded jewellery at affordable prices.